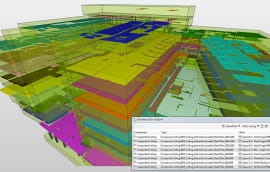 Innovative tracking and positioning technologies have enabled Crossrail to implement augmented reality BIM models and remote sensor software on mobile devices in the field. A six-month trial at Custom House Station in east London, overseen by Crossrail’s BIM in Delivery Working Group, involved field managers using iPads installed with augmented reality software to view planned construction works in 3D overlaid onto a view of the real site seen through the device’s camera. 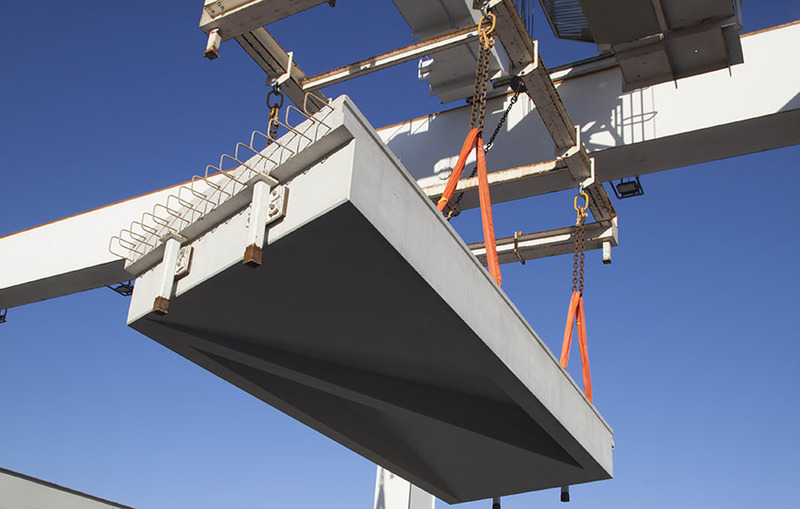 The software, provided by Metaio, enabled users to view the planned sequence of work for all the main pre-fabricated concrete structural elements in 3D and check them against the 4D construction sequence main contractor Laing O’Rourke was completing on site. 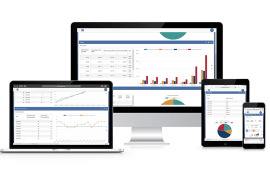 It included the functionality to select a structural element and update information on the iPad screen, for example the installation date, snagging comments, or requests for information raised against an aspect of work, with all the information synced back to the central office. 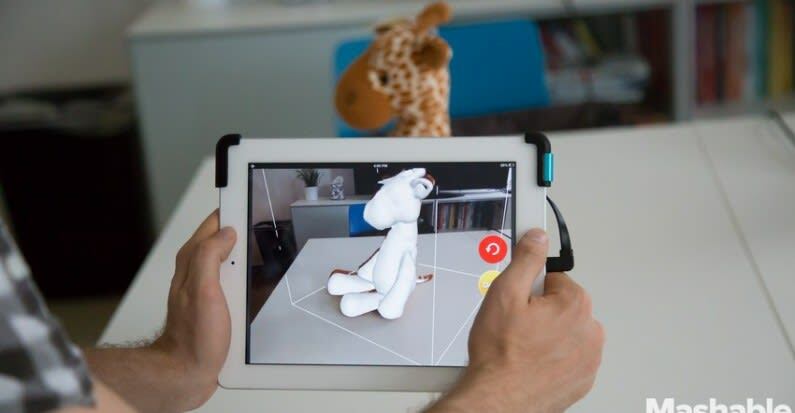 A hybrid of positioning technology was used to lock onto the iPad position and correctly display the 3D model. 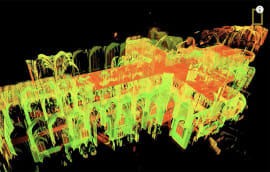 The built-in camera incorporates a sensor that can recognise the edges of columns or rooms, the software then interpolates the data to create a point cloud on the fly, which it compares to the 3D model to pull up the correct perspective view. The model locks into position and becomes more steady when sufficient points have been picked up by the sensor. Crossrail was able to further improve the level of positioning accuracy by trialling the Structure Sensor IO infra-red scanning technology for the iPad, which is able to sense depth in three dimensions. Launched to market following a Kickstarter funding campaign, the Structure Sensor device attached to the iPad is able to capture dense geometry and simulate real world physics. 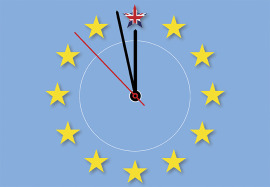 The Metaio software used this data created to provide a more accurate method of positioning. 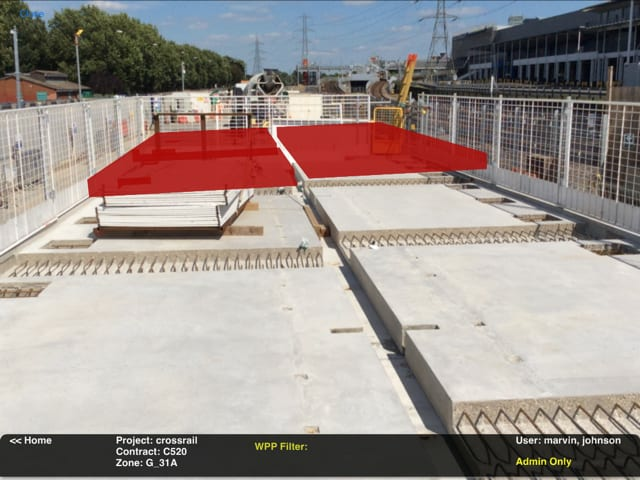 Crossrail’s use of augmented reality during the trial resulted in 45% efficiency gains in terms of construction progress monitoring and verification, by collecting data and verifying it within the software, rather than utilising traditional paper-based processes. Crossrail has been working with as many as seven different positioning technologies on project sites, used in different combinations depending on the level of visibility, access, cost and other factors. These communicate with about 40 trial mobile devices deployed across eight main station projects, plus the Wallasea Island habitat reclamation project off the coast of Essex. There are plans to deploy another 40 devices over next few months. Crossrail recently completed a trail of the iBeacon positioning system at its Bond Street Station site, utilising Bluetooth 4.0 low energy proximity sensing to identify the movement of people and machines to improve safety on site. Bluetooth 4.0 is a very low power, low-cost transmitter embedded in most modern smartphones, including iphone above iOS 8 and recent Android phones. The system installed at Bond Street, with support from Crossrail’s Innovate 18 technological support programme, involved setting up a local positioning network that triangulates between operatives’ Bluetooth phones, and Bluetooth transmitters positioned on plant and machinery, and a network of beacons set up across the site. “The aim of the trial was to understand the capabilities of using local positioning networks to improve the safety of operatives site and encourage safer behaviour,” says Smith. 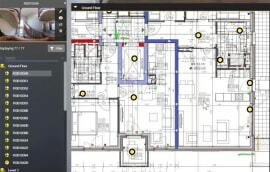 As part of it, new software was developed to manage and set up different zones on sites, for example safe zones, restricted areas, or exclusion zones, as well as rules for how the transmitters react when entering into those zones. The technology also has potential to track and identify the errant behaviour of individual users, but at present Crossrail has no plans to use that function due to privacy concerns.